Day three started out with Abby trying to have a little fun and improve her bod at the same time, tackling the ElectroDance Sphere despite the barfs it has inspired in her roommates in the past. She was rewarded with the Looney Tunes birdy noises and stars circling her head, but fortunately, her stomach contents stayed internal. I'm not sure who broke the tub (though my suspicion says Janie, who thinks it's a playpen), but Abby decided to take matters into her own hands and attempt to fix it. In the meantime, she gained her first mechanical skill point. You rock, Abby. 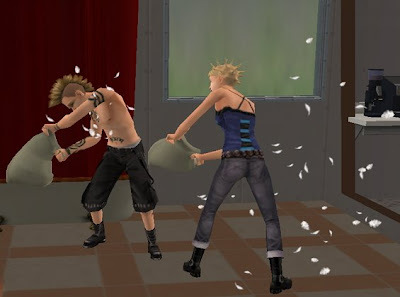 Unfortunately, due to a glitch in my photo editing program, I lost about 23 different screen caps of my sims' misadventures. I will attempt to sum up in a simple manner. Lots of tears ensued. I suppose they finally realized where they were, or perhaps two days is the max they can take without having a nervous breakdowns. Elektra cried when Jin picked on her, Jack cried for no apparent reason, Jared cried at least a dozen times because Julie kept inexplicably picking fights with him. Jin cried, I suspect because of exhaustion, and Julie cried, but only after Jared lost his patience and finally kicked her a$$. Apparently, she could only pick on him so often before he finally lost his gentlemanly proprietly and finally decided to lay the smack down. Skills were built as well! Jared got a cleaning point from his OCD scrubbing. Jin gained a cooking point from making mac and cheese for everyone. Abby gained two mechanical points. Elektra gained a cooking point from watching the Yummy Channel. 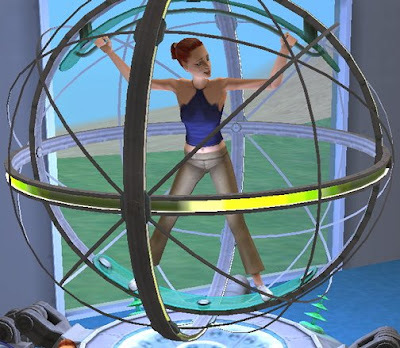 Julie immediately started working out on the ElectroDance Sphere after Jared laid the smack down. I sense a rematch coming in the near future. Some other stuff probably happened, but I forget what. Nevertheless, it's way too boring just to read my recaps, so let's just move on to day 4 so that you can have visuals. That is, if my computer doesn't decide to hate me more.